In an era of Bushes and Kennedys, will Maryland have a political dynasty, too? Occasionally there is a summer when spring never quite ends. Rather than hot, dry days broken by sporadic afternoon rain, the parching sun stays out in the Atlantic. Week after week, winds roll from the southeast to the northwest and back again. It rains with the rolls, and the winds hide the heat. Instead of rotting, squash grow bigger and more than anyone can ever remember. The stifling heat that makes the rot, encourages the borers, never comes. If you could count on those summers when June never quite ends, then planting tomatoes would be as mundane as setting onions. But such a gamble cannot be taken, because there are lives maintained by tomatoes. The anticipation of the acid, sweetened by salt, seems the life force that sustains old men. Maryland tomatoes, Carolina tomatoes, Jersey tomatoes, wherever their native soil, a particular taste is what each person looks forward to. My father decided it was time to move out of our old house when he could no longer manage his 85 tomato plants. Eighty-five plants for two people, but he would not even discuss a small patch closer to the back door or, worse, pots of stunted hybrids. In fact, as children came home less frequently and Daddy became more infirm, he had made the garden larger, even taking over the neighbor’s backyard. I grew up learning his ritual, which started with seedlings in blue one-pound coffee cans on the back porch. Then, on Easter Monday, Daddy would round me up to lug buckets of water out to the tomato stakes. Next to each metal stake, Daddy prepared an absurd hole  18 inches deep, 18 inches across  loosening the dirt at the bottom of the hole another spade depth. We then tossed some dirt back in and added peat moss and some rotting oak leaves from the bottom of the pile in our abandoned playpen. Then after sprinkling in one or two handfuls of fertilizer from the corroding enameled bucket, he would stir it all with a hoe. I would lay out a line of blue coffee cans next to tall rusty stakes. With a sharp pocketknife, Daddy would briefly admire each plant and then strip it of its leaves and branches. He pinched any flowers and spared only the top. He loosened the dirt from the edge of the can with a paint paddle and tilted out the plant, roots and all. He gently laid the roots and the stripped stem in the huge hole, the roots nestled by the soft mixture of peat, leaves and soil. The stripped stem was tilted so it could be covered as much as possible in soil when the hole was filled. The original roots had to be buried, away from the summer sun. The stem could be trusted to make new roots, spreading straight, shallow and concentric. Stem-roots that develop early when it is wet will do their best to take the rains that come in the summer, even the sprinkles that barely wet the earth. If the rains do not come, then the original roots spreading into the loosened earth below will provide the foundation that sustains the plant in face of whatever the summer might bring. Protecting the few remaining leaves with his hands, Daddy would cover the stem and roots with the soil that rimmed the hole. Then, as he held up the little crown of leaves, I would pour, low from a bucket, one or two gallons of water at the edge of the hole, making a rich, peaty, muddy stew. If all was right, the stew would quickly dry with the fertilizer dissolving and made ready. The dirt settled, and we added more soil. Then with a little soup can, Daddy would dip out some water, cradle the leaves in his hand and wash them of any dirt. To assure that no leaves would be trapped in mud, he frosted the ground around the plant with dry dirt. Every step of the ritual was contemplated, and what had been a beautiful 12-inch seedling was a limp helpless-looking stem sticking out of the wet, dark ground. They always grew. They had been put next to seven-foot stakes for a reason. In just three weeks, neighbors started to marvel. During May and June the plants grew beautiful and green, feeding off the fertilizer deep in the hole. They made little yellow flowers and little green tomatoes. 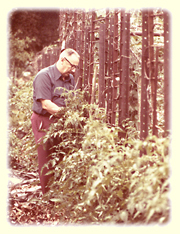 In the time before the early hybrids, in the perfect year, on July 5, his birthday, Daddy would pick the first ripe tomato. Then through July and August, as the sun turned hot, the tomatoes turned red and succulent. They reached the top of the stakes and started back down again. As the fruit began to overwhelm, the plants yellowed and wilted from the bottom up. The luxury of the fruit hung harshly on the withering plant, and they were suddenly ephemeral. Only in those easy summers were the plants head-to-toe green at the beginning of August. They could beat the yellowing fusarium. They flirted with you, suggesting permanence, ready to carry you through the winter. But even then, in the shorter days of September, the tomatoes stopped ripening, the plants tiring and becoming sparse. Daddy moved into a retirement community. He became dependent on tomatoes brought from the outside by children or nurtured by the more healthful in thumbnail community plots. The first tomatoes, eaten only with salt, were a singular joy that awakened dulling senses and fleetingly renewed the mind and body. As summer went on, tomatoes were passed up and down the halls and made it to the apartments of those completely housebound. They were brought to the cafeteria and sliced on the table in defiance of the food service. It is the magic of the tomato to capture the hot energy of the sun so it can be brought indoors and offered to old men and the infirm. There is powerful love in tomatoes. They provide a way to speak with reticent fathers, a voice so crucial that the plants must not fail. They must be made ready to stand the heat and drought, the famine or the feast, prepared for the worst and hoping for the best. North Carolina native Ricky Rood has had a home in Cape Anne since 1984, though he now teaches at the University of Michigan. He is a scientist whose fiction and creative nonfiction has appeared in publications around the country. This is his second Bay Weekly story, following “Christmas at the 7-Eleven” (Vol. xiii, No. 51: Dec. 22, 2005). Reach him at [email protected].